The Central Line in West Essex is a curious, twisting railway formed from a mixture of extensions to the original Central London Railway and the annexing of former Great Eastern Railway branches. Far from the centre of anything, a strange, post-war feel lingers around the stations on the line's extremities: enamel roundels resolutely remain on platforms and white painted canopies still run the length of the tidy, red brick stations. Only the presence of ticket gates and Oyster readers shoehorned unforgivingly into ticket halls reminds me that I'm in the 21st century here. Debden is no exception. A tiny station on the very fringe of the capital conurbation, the last stop before the Central Line flings out east to Theydon Bois and Epping. To the west of the station the commuter village straggles along the road out of town, but to the east there's nothing but countryside and motorway. This is where I'll start walking - here on the edge of things. The road is marked for Epping and Ongar - five and ten miles away respectively. Ahead of me the carriageway dips to pass under the M11 and then onwards into the rolling hills of Essex. The view couldn't be more English - a concrete slash through a green undulation. A little before the motorway crossing I turn south, a farm gate beside a battered sign for the Roding Valley Way leads onto a track which soon disappears into tall grass. The narrowest of ways worn in previous seasons, slowly growing over. I plunge in, realising I'm really not prepared for this walk in some ways. The noise of the motorway is still present, but muffled by the greenery. A distinctive chimney-sweeper moth flits across the path. Despite the line of tiled rooftops in the near distance indicating Loughton, I'm alone. It's been difficult to relax this week - sometimes painfully so - and the quiet hum of grassland swishes and chitters is remarkably soothing. The regular thrash as I beat through the grass, following the indistinct trail is satisfying too. My walks have taken me to the very edge of the city on plenty of occasions - but this is by far the most rural location yet. Glimpsing the shallow but broad stream of the Roding for the first time, I'm struck how clear the water is - and how the riverbed is mostly free of human detritus. The river bucks and curves in a wide, flat valley here - perfect for railway and motorway building - and they both flank its course along the north-eastern edge of London, hemming in the valley, but oddly protecting it too - making the narrow, irregular belt of green difficult to develop. Instead it is a ribbon of municipal playing fields, sports clubs, public parks and allotments - and sometimes just a rough scramble of grass and earth, tall reads and water-meadows. This is really somewhere rather special. It soon becomes pretty clear that this walk will follow the course of the valley floor rather than hugging the bank of the river. The path casts me westward, out of the grassland and into a neat playing field. The ubiquitous joggers pad by and dog walkers watch their animals capering in the water. Near a cricket club I spot a tiny bridge arcing over the river, dedicated to a local politician - I take a picture but continue to walk the western bank. Oddly, this bridge could have saved me from a diversion and kept me near the water - but instead I follow the path, hoping that the gap in the line on the map is an omission. It seems to be at first - plunging me along a well-worn track between the river and a lake. I'm confronted suddenly by a fisherman barking into his mobile as he strides back and forth: "I had to drop the boy off at Heathrow.... Nah, three hours before departure now..... Can you facking be-lieve that?". I emerge into another playing field and skirt the edge, following a clearly beaten path to its south-eastern corner. I trust the faintly worn desire-line here, leaping a little ditch and ending up on a rough track where the Roding passes under a lane bearing its name. There's no way through, and no way onto the lane. I follow the track to another frustratingly locked gateway before retracing my steps over the ditch. I finally resort to thrashing out of a tiny but well-trodden gap in a hedgerow onto a beautifully manicured cricket pitch. Interception seems likely - so while I edge around the boundary rope I rehearse arguments about the inadequacy of the map. Checking later I noted that there was another bridge which would have taken me into the environs of a nearby health club - but ultimately further away from the water. My wish to walk as close to the river as possible was, it seemed, drawing me away from it. For a while, at least - the pathway was clearly marked Roding Valley Way and after an unpromising dog-leg around a sports ground, gave way onto a pleasant public park. I could see my route ahead disappearing into the trees fringing the river, so I decided to rest a while and apply sunblock. The dull ache of the clouds was breaking and I sensed a warm afternoon ahead. It felt portentous and stormy. I watched a huge, muscled black guy conducting what appeared to be an endearingly tender conversation via mobile while his slavering Bull Terrier worried him to throw a ball despite its apparent inability to stumble along at more than a few inches per second. Finally I decided it was time to press on, and headed for the bridge - only to find it gated and locked. There seemed to be no reason - it was in good repair, and the path on the opposite bank of the river was in use. I turned back again, passed the drooling dog waiting for its next low-speed chase and headed into the park. As I followed the long driveway from the strangely serrated roof of the visitors centre to the street, a police car edged along ahead of me before spotting a suspicious rough-sleeper in the hedge and peeling off across the grass to investigate. A little crowd assembled - but I headed for the exit. This stretch of the walk had been frustrating and I wanted to escape the suburbs. I turned onto the wonderfully named Snakes Lane East just as the Police car left the park and passed me, having left the rough-sleeper to his own devices. As I waited to cross the street, a car reversed out of a driveway at ludicrous speed, sending a cyclist lurching across the street almost into the Police car's path. The driver seemed oblivious to the near-miss and stopped, signalling the Police car to pass by. The officer shook his head and motioned him back into his drive, turning to follow him. By the time I passed the scene the driver was already yelling about it being "racist" to stop him - at which point a surprisingly imposing Asian Metropolitan Police officer began to unfold himself from the tiny car, much to the surprise of the driver. I left them discussing his motoring skills as I turned onto the busy dual carriageway of Chigwell Road - noting that among a row of tiny suburban shopfronts, next to a self-declared Washing Machine Repair Specialist, was a firearm dealer. The incongruity of the trade in ammunition and weapons with the mock-tudor frontage and the suburban location immediately played into the Essex tradition of low grade gangsters and tooled-up small-time criminals. I struck out for the Esso station - expecting at least to get an expensive refill of my water bottle and an ill-advised snack. As I approached, I noted that nestled between the filling station and the motel-like Broadmead Baptist Church was a narrow pathway with a carved Roding Valley Way arch. So, once equipped with terrifyingly expensive provisions, I edged rather carefully into the dogshit strewn channel between high razor-topped fences, which swiftly opened up into a narrow bridge over the still clear-running Roding waters. It was good to be back with the river, even if my path was going to run a little way from it for a while longer. Ahead of me were the dividing lanes of the M11 with the tiny stubs of the never-built M12 between them. The first carriageway was burrowed-under by way of a pitch dark underpass with the second soaring above me on high posts, leaving a dusty concrete plain beneath. This was as close as I'd get to a picnic spot, so I took the opportunity to eat and review my options under the shrill trauma of traffic desperately slowing for the end of the motorway, or accelerating out of the city's gravity. I was in the midst of the turmoil here - in a widening apron of negative space on the map left by an incomplete road scheme. The Abercrombie plan for London came to a halt above me in concrete reality. This spreading triangle of land should have seen the carriageways of the M11 continue south - heading for the Inner Motorway Box at Hackney Wick. 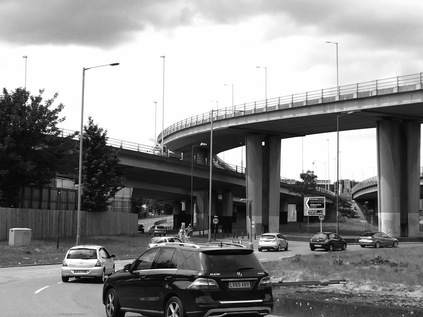 Instead, the flyovers describe a series of graceful but unnecessarily complex arcs, piling through-traffic onto the North Circular while city-bound travellers are deposited onto Charlie Brown's Roundabout. Named for a pub which was demolished in 1972 to accommodate the enlarged roundabout and tangle of sliproads, this provided a neat historical arc linking me back to my other walks. Charlie Brown's original pub was in West India Dock Road during the heyday of Limehouse as a churning confusion of day-paid dockers, furloughed sailors and ungoverned immigration which would curl the toes of Farage and company. A few years after the original Charlie Brown - the 'Uncrowned King of Limehouse' - died in 1932 his son upped sticks and headed for Essex like all east-enders made good, relocating to the pub in South Woodford but retaining the historical name. In a cruel twist of fate, the original building survived this new venue, but was finally claimed by another road scheme being demolished for the building of the Limehouse Link tunnel. Opened in 1993, until recent times this was the most expensive stretch of road ever built in Britain. In the same period, improvements were being hawked which included the much compromised M11 Link Road - which, when finally built, settled the sorry tale of the south end of the motorway with massive demolition and destruction of long-standing communities in Leyton. It also signalled the start of a series of organised anti-road protests which have dogged road schemes ever since. These strange sequences of events - the cycle of blight and destruction, of inheritance and self-improvement - seem to sum up this part of the world for me. My own engagement with Charlie Brown's roundabout was to carefully pick a safe route around its edge, finally finding myself above the Roding again as I turned south briefly onto the continuation of Chigwell Road. Somehow, beneath the stacked layers of flyover and roundabout, the winding river kept flowing - only a little battle-scarred by rainbows of fuel and run-off in the process. Finding a tiny gateway, I turned aside and once again found myself on the western bank, the path edging around the sliproad carrying eastbound traffic onto the North Circular. The little cliff caused by the curve of the stream encountering a sloping panel of supporting concrete made a strangely attractive prospect under the brutal weight of road above. A line of pylons marched into the valley here - and would accompany me on this stretch of the walk like a guard of honour. From here I was walking west of the river but east of the road, in a narrow channel of green which gave occasional glimpses either down into the deep, lushly weed filled valley where the river ran, or up onto the nearby carriageway of the A406. The path tracked the road, used only by me and a small band of squirrels which blithely zig-zagged in front of me. It was cool and, despite the drone of road noise, curiously peaceful here. On the opposite bank a disused pumping station stood on the otherwise surprisingly undeveloped bank, gleaming yellow London brick in Spring sunshine. I finally passed under the A406 a little north of Redbridge Roundabout, by way of a strange concrete bridge carrying both the sluggish river, its towpath, and a broad roadway which was presumably above the flood level. Here I made some grave navigational errors - emerging from the underpass at the roundabout and confidently trudging along the edge of Royston Gardens, I lost my nerve at the entrance to allotments with a "no unauthorised visitors" sign. I think I was mostly just convinced that a way through just wasn't possible. Instead I backtracked, at first to try to access the park via Royston Gardens - which seemed impossible, and then to review my map: only two routes sprang out as potentially possible I elected to pass back under Redbridge Roundabout and exit via Wanstead Park Road which runs parallel to the North Circular - not quite so long, but seemingly offering a link back to the river. 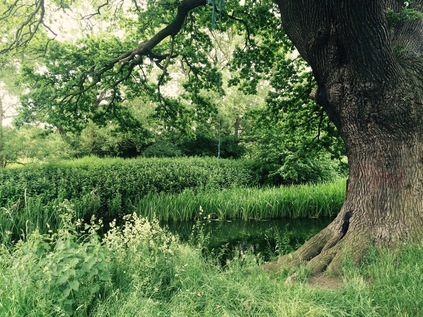 Sure enough, after trudging the long, quiet street and navigating the chain of off-duty cabs and the dumped remains of beds and freezers, I found a curving bridge over the main road which deposited me on a network of paths in the green space running along the rivers' edge. I was soon back in the cool, mossy tunnel between bushes and riverbank. A little way along, beside a sign announcing the entrance to Epping Forest, I met a Polish family and had a good-natured but strange chat about whether any large dogs were up ahead. Their tiny mutt capered around, clearly not up for much of a scrap this time. Underway again, I found myself sandwiched between allotments packed with glittering makeshift bird-scarers and the edge of the City of London Cemetery. A strange fluttering noise above alerted me to the beginnings of a rain-storm, the canopy of mature trees providing shelter and preventing the drops from reaching me. The river was parting company now, heading south-eastward into Ilford while the Aldersbrook accompanied me south. 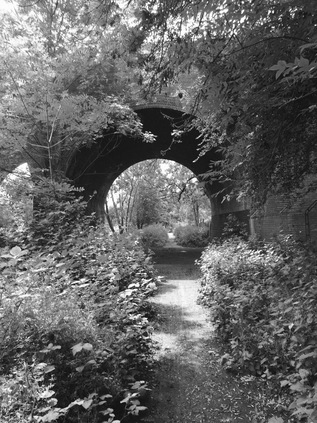 Rather unexpectedly, the brick viaduct carrying the railway to Liverpool Street loomed ahead, with a long underpass allowing access south of the tracks. As I left the tunnel I felt great spots of rain begin to fall. By the time I reached Romford Road, the sky was black and the rain was stinging my face. I put up an umbrella which fended off the worst of the tumult, but soon seemed to be letting water in too. The rain continued. The gutters filled and motorists took turns to accidentally - or in some cases not so - spray waiting pedestrians. Busses slowing for the stop kicked up a huge wave in the roadside gullies. I thought about moving on - heading for Ilford - but it was horribly wet still, and worse once out of the lee of the buildings. I waited it out under a brolly. Others had been luckier, finding telephone kiosks or spots under shop awnings. By the time I considered the torrent had abated enough to move on, my lower legs were drenched, as was my back and rucksack. I slurped away through a tide of water running on the pavement - there was no way I could walk on to Barking now with the weather still uncertain and the way not fully clear. I cursed both the weather and my ill-preparedness for it. As I slogged the final few yards up Ilford Hill I noticed people wearing sunglasses, dripping shorts and skin-like wet t-shirts heading my way. We'd all been caught unawares it seemed. I failed to dry out on the bus to Barking, or on the diverted C2C service into Liverpool Street which I'd caught just to cover an uncommon bit of railway line. I even stayed damp after an extended coffee-layover at the station, my trouser-legs flapping moistly around my ankles in a strange and uncomfortable fashion. By the time I walked up to the ticket gate at Paddington some three hours later, there was still a tide-mark of damp on my shins, my shirt still clung to me. I passed a badly mangled ticket, rescued from my soaked bag, apologetically offering "I'm sorry....the rain, you see....". The gateline operative glanced oddly at me and muttered as he passed me through the gate "RAIN? But we ain't had any here!". I wearily settled into my seat, feeling a tingle of the strange and pervasive British guilt that such interactions often carry - where I'm not at all to fault but feel a need to fix things. I'd last seen the Roding as I walked to the bus stop in Ilford - passing under the roadway, its sluggish meander now a surprising torrent of water. But for today, it had thrown me off the scent once again. 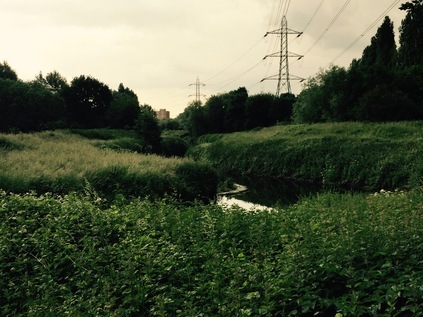 The Roding is assuredly not one of London's mythologised 'lost rivers' - although it's often hidden, sometimes in plain sight under a pile of stacked motorways, or behind a screen of suburban villas. Today it refused to give up its secrets easily.